My opinion about politics and elections. I am very interested about the decisions that politicians make, those decisions will have consequences on my country and me... but I don't like and I don't believe in politicians. For that reason, I have never registered myself to vote... but I'm registered anyway, because now that process is automatic. The fact that now I'm registered to vote doesn't change my mind, and I will not give my vote to any politician. Why don't I like politics/politicians? Because I think that (almost) all the politicians are only looking for power/money and nothing else. Politicians don't care about people, they are selfish, arrogant and thieves. We can look back in History and we'll find a lot of suffering caused by politicians in a lot of countries and epochs. They only act like in a theater, they just make us to believe that they are good intentioned persons... but it's just a big lie. A politician should be an intelligent, honest and a good person in general, but it is really difficult (or impossible) to find a politician with those attributes. Maybe, individuals are not prepared to have too much power, I think power corrupts individuals. About the campaigns... those are horrible! You can see all the streets with many "palomas" (big pictures with the face of the candidate). Palomas make the city ugly, and after the elections nobody will take away those things and they will become into garbage. Sometimes, I fantasize about becoming a politician, but I inmediatly abandon that thought. To be a politician requires a lot of money, and you need to convince people that you are the right person to be chosen. You also need to know powerful and rich persons who will sponsor your campaign... if you later make laws or decisions that benefit them. -What qualities should a person have to run for a public position? 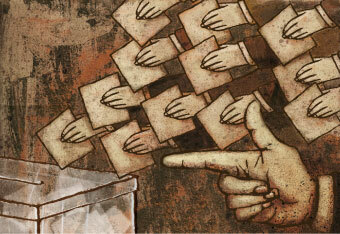 -Make a constructive criticism to the electoral campaigns in your district?